MARIE-ALICE, wife of French Ambassador Patrick Andre Leclercq is not only tall, attractive and outspoken --too outspoken say some of her sniping peers--but she's also blessed with intellectual genes. If one of her ancestors launched the renowned publishing house of Armand Colin in the middle of last century, her paternal grandfather, Victor Berard, was the noted Hellenistic who translated Homer's Odyssey. While her worldliness comes natural to most diplo-brats, Marie Alice's savoir faire, flair and confidence comes from the fact that she is the daughter of the late Armand Max Jean Berard. Besides being one of his country's top diplomats, Armand Berard (1904-89) was a noted Greek scholar, historian and author. He twice headed France's permanent mission to the UN (1959-62; 1967-70) and as president of the Security Council, was a constructive player in the dicey Arab-Israel dispute which dovetailed the June 1967 war. It was as France's ambassadors to Japan that he received the nickname Fujiyama reference to his 1.92 meter frame and snowy white hair. This explains partly where Marie-Alice gets her allure. Marie-Alice spent her formative years in some of the world's smartest residences including Rome's Palais Farnese, the French Embassy in Tokyo and the elegant Park Avenue duplex in Upper East Side Manhattan. During time out from Colombia University where she studied journalism there were the riding outings at the Hamptoms and the picnics at Jones Beach. You'd think that upon graduating and joining the metro-boulot-dodo circuit it would end there. It didn't. 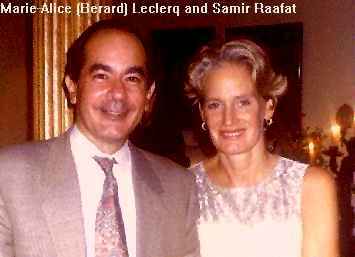 Marie-Alice still lives in grand homes (French Embassy Amman 1985-89; Cairo 1991-1996) but this time as the wife and not as the daughter of a French diplomat. Although the lifestyle risks being deja vu, those who met Marie-Alice or attended one of her candlelit dinners, affirm she's got the oomph and enthusiasm indispensable to her demanding, and at times overbearing, position. But she certainly knows how to run the show whether it's putting on the Ritz for a visiting dignitary or organizing a charity garden fete in the Embassy's garden. Yet, what of her present palatial residence? What do we know of its history ÷who built, owned and lived in it. And what is this interesting pink pavilion in the south west corner of that splendid garden? Who planted those magnificent trees? Few answers from the Frenchmen who either worked or lived there. What we do know, is that at every 14th July garden party, gawking excellencies, Cairo's bold and beautiful, survivors of the ancien regime and some disdainful pseudo-royalty, agree that elegance and chic still reign at No. 29 Giza Avenue. Anyone trying to research Cairo's grand mansions, will realize this is no easy task. Perhaps, in this particular case, with the help of oral history and investigative journalism, the story of one of Cairo's last grand homes can be reconstructed. But unless someone makes the effort these few lines may become the last informative link between what was and what will have become of No. 29 Giza Avenue in the next century. Unfortunately, the present is unable to live with the past. Although diplomatic relations between France and Egypt go back several centuries, it was during the last when the first French Legation or Agency opened in Cairo and even then was subordinate to the one in Alexandria. The first French Agency (or consulate) was located diagonally opposite the old Shepheards Hotel on Kantaret al-Dekka Street (later Naguib al-Rihani) ) before moving in 1887 to the European district of Ismailia, opposite the old hippodrome. For the sum of one million francs the French Diplomatic Agency took over the amazing okel (a corruption of the Arabic word for Agency or wekala) of antique collector Charles Gaston de Saint-Maurice along with its priceless artifacts. Saint-Maurice served under General Fleury before becoming Khedive Ismail's Master of the Horse. It was Saint-Maurice who fitted Ismail with magnificent stables copied from those of Napoleon III. His neo-mamlouk okel with its mashrabeya windows and its facade painted in broad bands of pink and orange was built by French architect Ambroise Baudry (1838-1906). Bordering Kasr al-Nil, Chawarby and Madabegh (now Cherif) Streets, the okel was contiguous to the Aero and Royal Automobile Clubs, and to the British Benevolent Society. Across from it on Kasr al-Nil street stood the National Bank (today The Central Bank). One of the better known consuls who lived and worked there at the turn of the century was de la Boulinière. As for the French consulate-general or Maison de France was called, it moved in November 1925 from Rue Djelal in Ezbekieh to its present day location No. 5 al-Fadl Street. While the land was purchased through public subscription from among Cairo's French residents, the ornate premises was designed by Paul Conin Pastour, director of public buildings in the Egyptian government. The ground-breaking ceremony took place on March 13, 1925, in the presence of the French Minister M. Gaillard. By the mid-30s, it was the turn of the French Legation to look for appropriate quarters away from the City's bustle. Preferably, a location fronting the Nile in Giza since Garden City and Zamalek were already spoken for. By 1936, the riverfront between al-Galaa and Abbas (now Giza) bridges had become an exclusive suburb. The ribbon of stately mansions overlooking the Nile stood on what had once been part of Khedive Ismail's Giza Palace and its enchanted gardens. These had since imploded into the Giza Zoo, Orman Gardens and the nucleus of urbanized Giza. The new mansion owners represented the mosaic that made up Egypt's wealthy urban class: landed gentry, pasha-politicians, Levantine bankers and rich merchants. No. 29 Giza Avenue belonged to Sinot Hanna Bey, a Wafdist senator from the city of Assiout. His neighbor to the north was the another staunch Wafdist and several times foreign minister, Wassef Boutros Ghali. And across the narrow street to the south was the home of another Wafdist minister, Kamel Sidki Pasha. All three gentleman were Coptic notables. On July 23, 1933, Sinnot Hanna died. 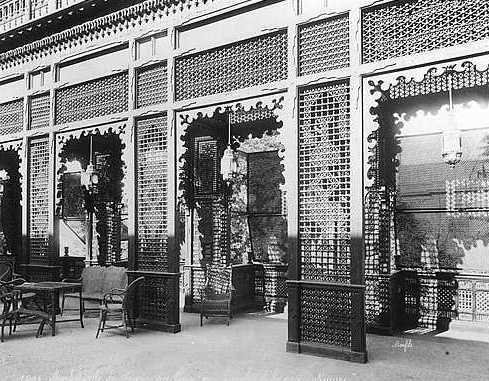 Three years later, his widow and his only daughter Mrs. Camille Emile Alexane, sold the Hanna mansion to the French Government which proceeded to refurbish it a la française with heirloom tapestries, china vases and the works. Thankfully, the two-acre garden needed no improvements. Khedive Ismail's trees, a legacy from his famous botanical parks were still very much in evidence. All that was missing was a chancellery. In 1937, architects George Parcq and Jacques Hardy designed the new French chancellery taking into account they would transpose therein antique pieces from the old legation. Hence the colossal door, the Great Hall's wall and the exquisite ceiling woodwork. There were also the mosaics, the fountain, the marble columns and arches and the pottery and statuettes to be considered. The result was the resounding masterpiece located in the south west corner of the garden. For a few years at least, the ensemble would serve to remind visitors of the old legation's arabesque character. The latter had meanwhile been sold and placed by four giant apartment blocs collectively known as the Immobilia Buildings designed by architects Max Edrei and Gaston Rossi, and completed in 1940. In 1938, the French Agency, headed by Baron Pierre de Witasse transferred to the new premises. 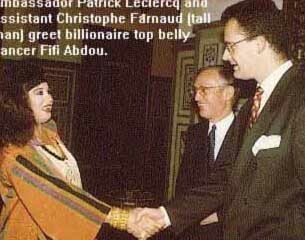 According to an embassy source, Witasse celebrated the move with an extravagant gala reception on February 19, which coincided with King Farouk's week-long birthday celebrations. A year later, Witasse, who as a young diplomat had served in Alexandria on the eve of WW1, announced the mobilization of all able-bodied Frenchmen in Egypt. And just as "les poilus" were getting ready for WW2, Baron Pierre was replaced by Jean Pozzi, a familiar figure in Cairene society; his wife being sniped at as "une greque d'egypte". The Pozzis tour of duty ended in shame and recriminations for not only were they socially and politically ostracized by half of the French living in Egypt, but they were declared persona non grata and asked to leave Egypt because of their Vichy connections. Against advice from his peers the unfortunate Jean had thrown his lot with the hated Petain Government which had signed the June 22, 1940, Franco-German Armistice. As the dejected diplomat and la greque departed for Palestine on March 31, 1942, the Swiss flag was hoisted above No. 29 Giza Avenue. Although France was no longer directly represented in Egypt, during the first part of the war the French had had the benefit of two bitterly opposed legations operating simultaneously in Cairo. While Pozzi represented Vichy from his Giza chancery, Baron Louis de Benoist, president of the Anciens Combattants, stood in for General de Gaulle's France Libre from his unofficial headquarters in Garden City, right across from the British Embassy (today the Banque du Caire et de Paris). In 1944, French diplomat Jean Lescuyer retook possession of the Giza premises on behalf of the Free French. From then on, successive French ambassadors are remembered in Egypt either for becoming an important footnote in history or because they left their persona on the Giza residence. Only the de Murvilles, who replaced Gilbert Arvengas in 1950, are remembered for both. Maurice Couve de Murville witnessed first hand Egypt's transition from a monarchy to a republic. Shortly after returning to France in 1954, he became his country's minister of foreign affairs and later its prime minister under Charles de Gaulle and George Pompidou. De Murvile's wife, Jacqueline Schweisguth --also known as Vera Fabre within artistic circles and 'Couvette' amongst intimate friends-- was responsible for introducing the Salon Bleu at No. 29 Giza Avenue. And contrary to current belief, she did not paint its famous ornamented panels. These were ordered directly from atelier Zuber de Mulhouse in Alsace. Murville's successor was the courtly Comte Armand du Chayla. He watched in alarm as France's relations with Egypt took a free-fall. His agony was cut short when, immediately following the October 1956 Tripartite Aggression, his deputy Guy Dorget handed the embassy keys to Max Koenig the Swiss diplomat who, for the next few years, would become custodian of Franco-British interests in Egypt. Seven years passed before the Tricolor flapped once more above No. 29 Giza Avenue. The first post-1956 French ambassador to Egypt was Jacques Roux. It was Consuello, his rich and flamboyant Latin American consort, who was responsible for the chancellery's pink color. Somehow a casa rosada reminded her of South America's stately colonial government houses. Roux was succeeded in 1968 by Francois Puaux who had, in his younger days, worked in the French Section of the Swiss Embassy in 1943-44. Then came in succession, Baron Bruno de Leusse de Syon (1972); Comte Jacques Senard (1976); Jacques Andreani (1979); Philippe Cuvillier (1981); Pierre Hunt (1985); and Alain Dujamet (1989). From Autumn 1991 to date No. 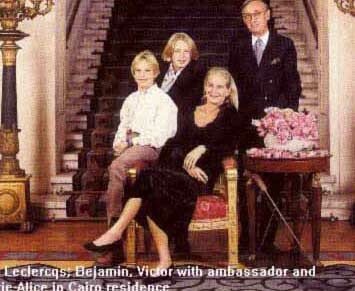 29 Giza Avenue is home to Patrick and Marie-Alice Leclercq along with their children Victor and Benjamin, and Loukoum, their white French poodle. 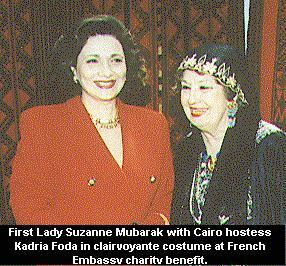 During the early part of their sojourn Giza's most beautiful embassy residence received a sweeping face-lift its interior refurbished in that stylish, chic and unapologetic way as though echoing the character of Egypt's first French lady. For those who haven't visited it, No.29 Av. Charles de Gaulle is not just a residence. It's a point of view and a statement where many consequential political, cultural and financial resolutions were instigated. On a social level, it embodies a sense of audacity, spontaneity and savoir only the French know how. (With respect to Abroise Baudry see excellent book by Mercedes Volait "l'Egypte d'un Architecte" Editions d'Art-Somogy, Paris 1998).